I did just birth him - like yesterday - but somehow he's old enough to start school. I don't get it. SEE WHERE HIS LOCKER IS! Oh my word. He's 4, y'all. And, he has a locker. Breathe, Sarah. Breathe. My camera comes with me just about everywhere. And, since I didn't want to intrude like a picture taking madwoman on his first "official" day, I took my camera with me to his open house. I got some pics for some other Moms who didn't bring their cameras, so I was glad to be able to bless them that way. So, here they are. 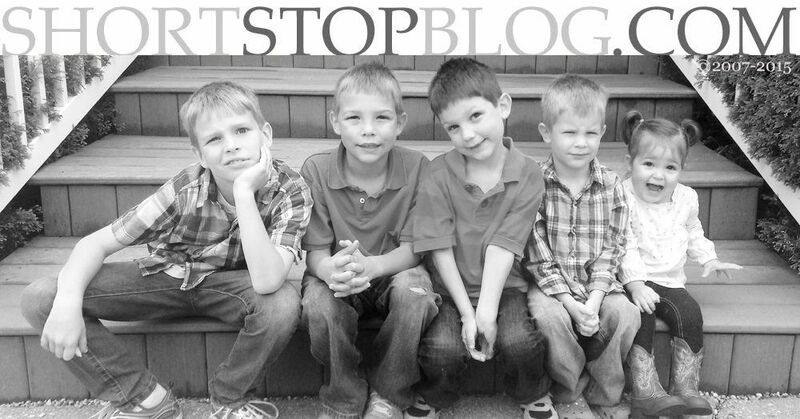 Pictures of Jack's first day of preschool...with ramblings. Courtesy of his proud Momma. Here is the front of Jack's locker. 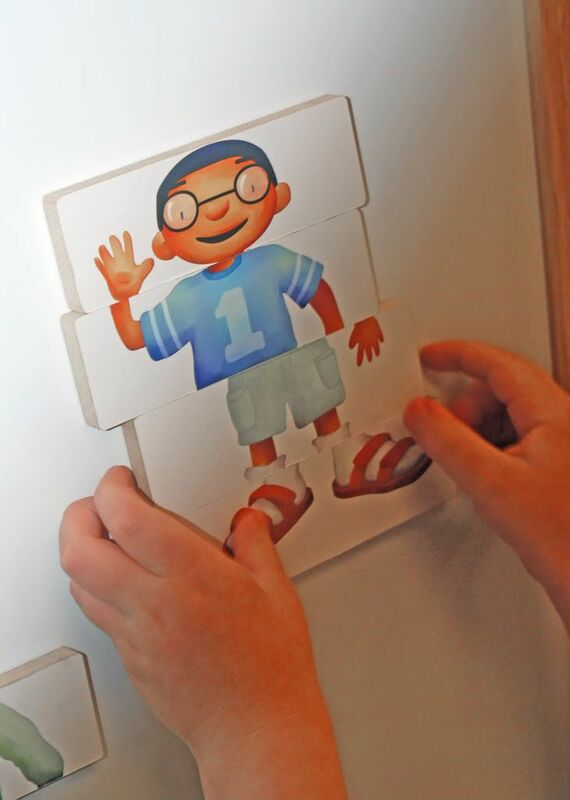 He is in the Sunshine class. 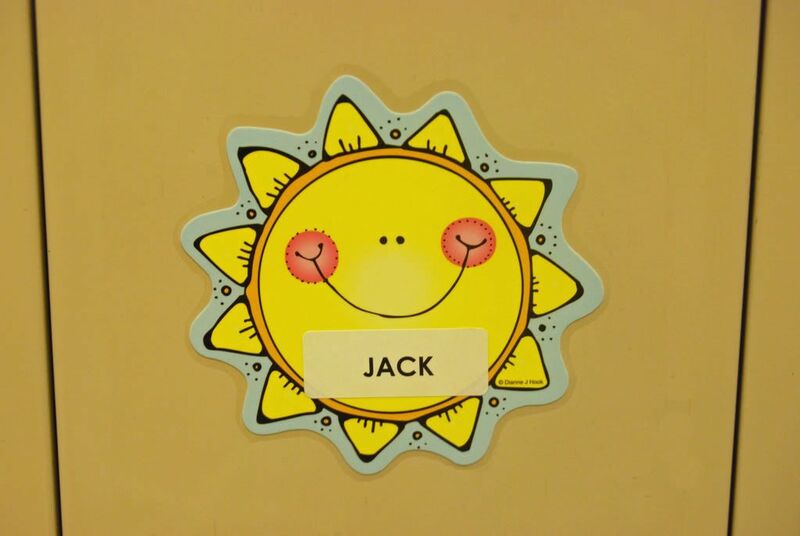 Appropriately, his name is permanently affixed to his locker with a sunshine nametag. 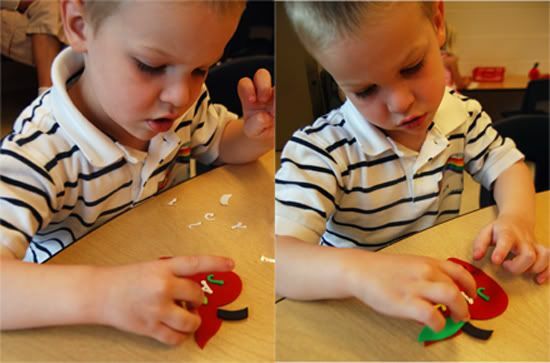 One of the first things we did when we got to his classroom was work on a craft - an apple magnet. He worked so hard to make sure everything was just as he wanted it. And, he was SO proud of it when he finished. "JACK...the apple of God's eye." 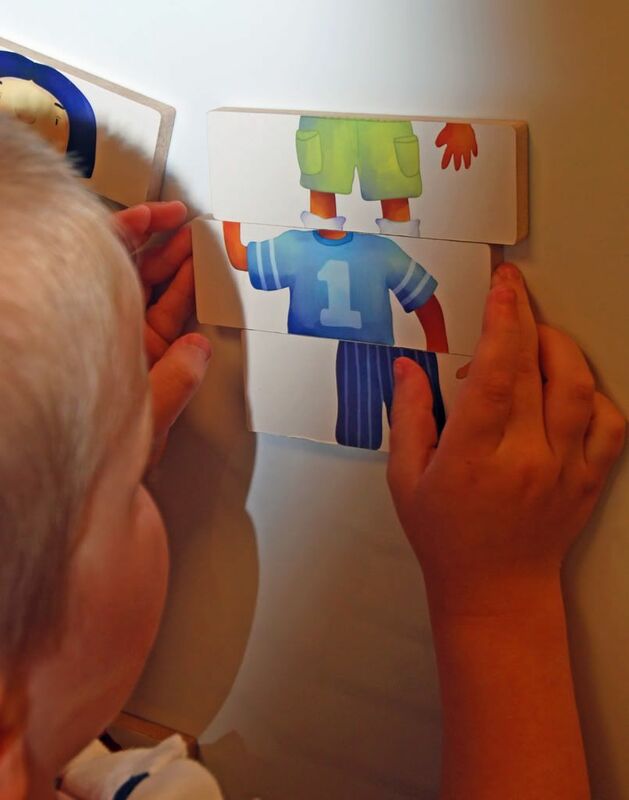 He loved the magnetic board with different body pieces. He took one look at this boy, and said "That's so silly, Mom!" And, then he carefully rearranged him. "See, Momma. He's not all squiggly now." Then, he found the food. 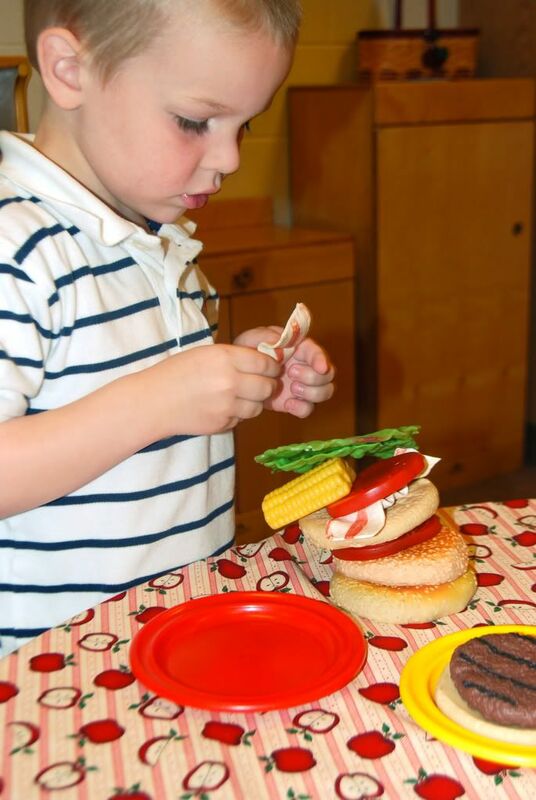 As he was stacking his hamburger, he kept saying, "It needs more bacon." Yep, we're major bacon eaters in this house. I love the piece of corn on the cob sticking out from the side. And, to top it all off - a piece of cake. Oh, he is SO my son! He was a bit shy when he met his teacher - Mrs. B. I seriously think she is the nicest lady I have ever met in my life. 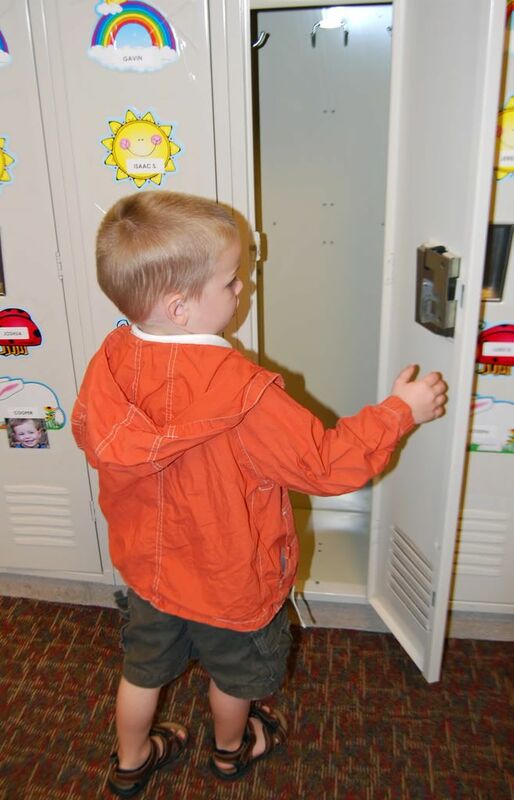 When we were leaving, I showed him his locker. He was so excited that he will get to put his coat and backpack in there. He kept opening and closing the door. Our big boy. Ready for preschool. I took him to McDonald's on our way home. As we sat enjoying our lunch together, he looked up at me with those beautiful blue eyes and said, "Mom, I love school." I've never been more overjoyed and heartbroken at the same time. 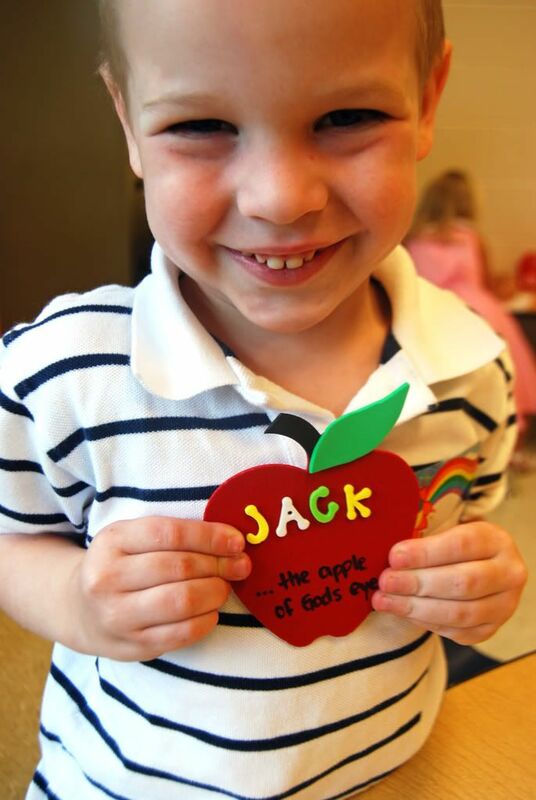 Happy Preschool Year, Jack. You're the apple of Momma's eye, too! Those pictures are so sweet. You really captured his day well. I'm glad he likes it! Awh Sarah... I am totally going through this with you girlie. My son had his orientation last week too and his first day was on Friday. We both did MUCH better than I thought we'd do, thanks to a summer of praying about it. I feel the same mix of happy and sad as you described. Great job capturing this milestone in Jack's life. Happy preschool! He's not even mine and I am tearing up.... i can see his joy, and know how hard it is to be joyful with them when your heart is breaking at the same time because they are growing up. It's so hard to let them grow up isn't it! He looks so happy though. What fun he's going to have at preschool! Ugh, I just got teary eyed. 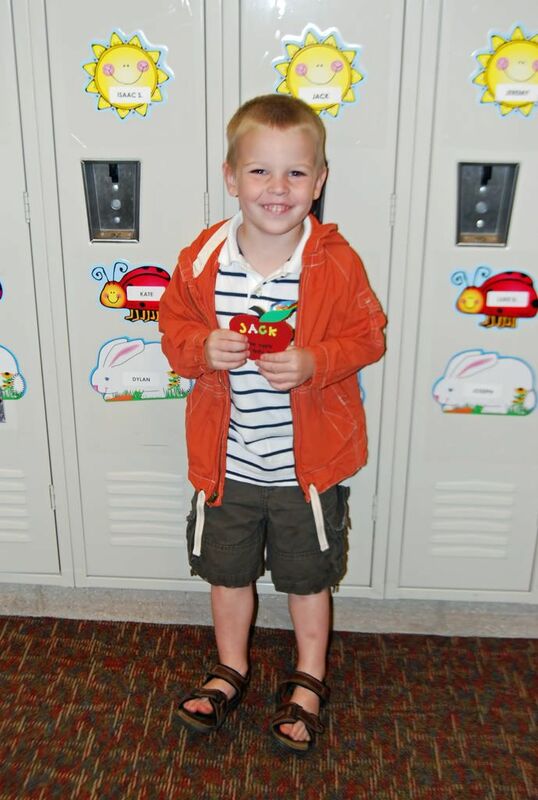 I can't believe he is in Pre-School already. You will do great! And so will he with all the love he gets from Momma and Dad. Wow - a locker already? Isn't it exciting to see a new season of life - and he loves it! That's got to make you feel good. He'll have a great year!! awwwwww! What a big boy!! So bitter sweet isn't it?! I can't believe he is old enough to start pre-school!!! Where has the time gone??? Love you guys! We have orientation on Thursday and my heart skips a beat just thinking about it - both excitement and anxiety! Looks like Jack had a great time which will hopefully put you at ease a little bit. :) Hope he has a great first day! It looks like he's having an awesome time at preschool! OOOh, Sarah! My heart is leaping with joy and breaking a little right with you. I can't even imagine the twins' first day of school and it will be here before I know it. Eek. Jack is SO cute and I'm so excited for him to be able to put that energetic genius of his to work! Love you, my friend. Awww, ohmygosh I can't believe how maturely he handled it :) He sure is growing up! What happened to that baby boy who did the strong-man all the time or shreiked when were all out at a restaraunt? Love the pics, Sarah & Jay--thanks for sharing with us :) Tell him we're so proud of him and can't wait to hear all the things he's learning in school!! what a great post. how fun to have this officially documented online so you can look back when, like, he starts high school. i'd imagine his orientation there will be a bit different. i think it is Jason who at work loads up on bacon at the salad bar because it is light (cheap) and he seems to enjoy it. So the bacon comment made me laugh. where is jack going to school? near to your new place? he's got to be in the best class they have there... SUNSHINE! that's the class i would want to be in. 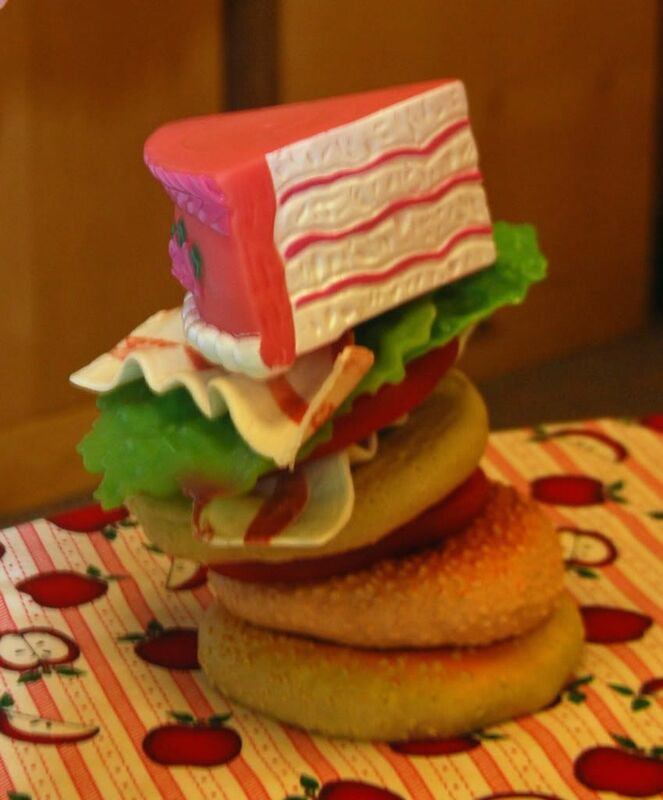 i think you need to do a refresher course on how to build a hamburger. all of that stuff - including the piece of cake - needs to go between the buns. have fun at school, jack. and i'm sending over the tissues to you mom. Yeah! Sounds like it will be a great adventure this year! 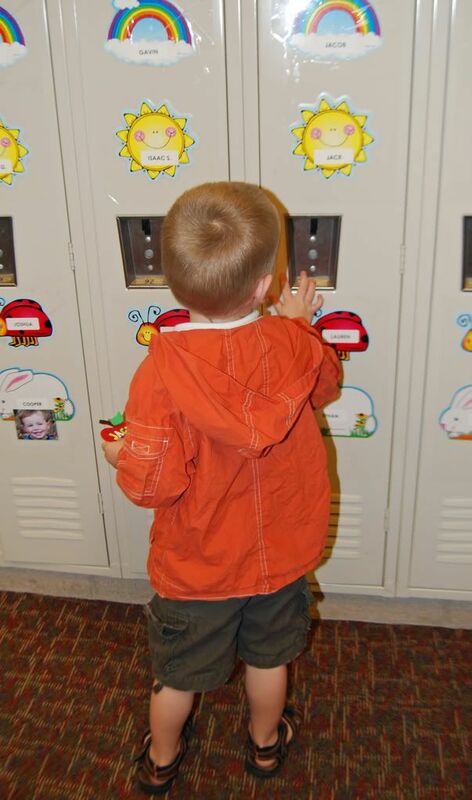 He does look so grown up in front of his locker. Enjoy your time with the other two at home. That goes quickly, too! awww, too much for my heart to take this week. he's going to have such a great time; I'm so excited for him. looks like an awesome school. love and miss you all!! bitter sweet! What a big boy....and yes, he was just a baby!!! Unbelievable!! Love the big mac creation! Oh Sarah, what a big step! He looks so happy and SO ready! His teacher just looks like someone you have to love. 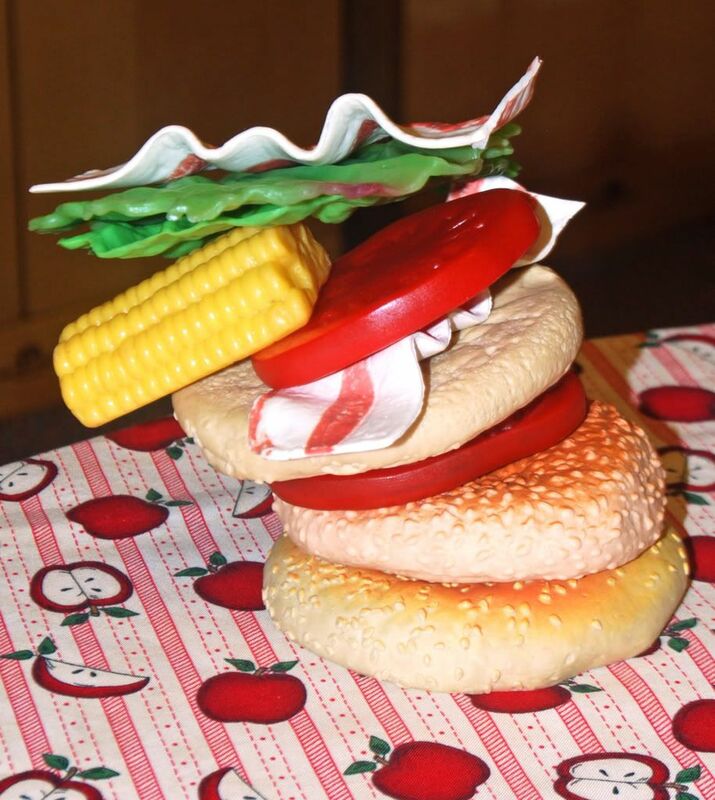 That looks like a Red Robin burger! That last picture will be forever in your mind when you think of Jack. Thirty years from now you will remember that sweet craft and his sweeter smile. Bless your heart. It's tough, but it will be great for both of you!